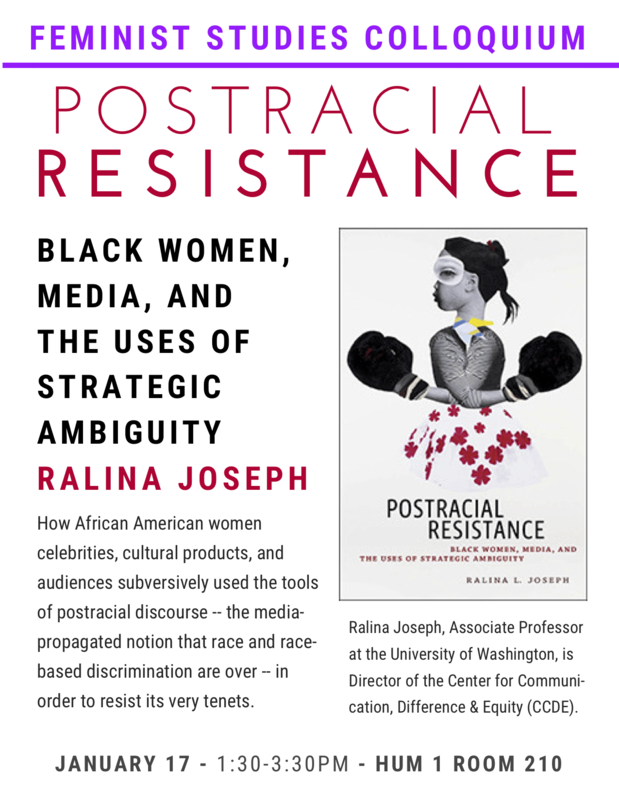 Postracial Resistance: Black Women, Media, and the Uses of Strategic Ambiguity. How African American women celebrities, cultural products, and audiences subversively used the tools of postracial discourse — the media-propagated notion that race and race-based discrimination are over — in order to resist its very tenets. 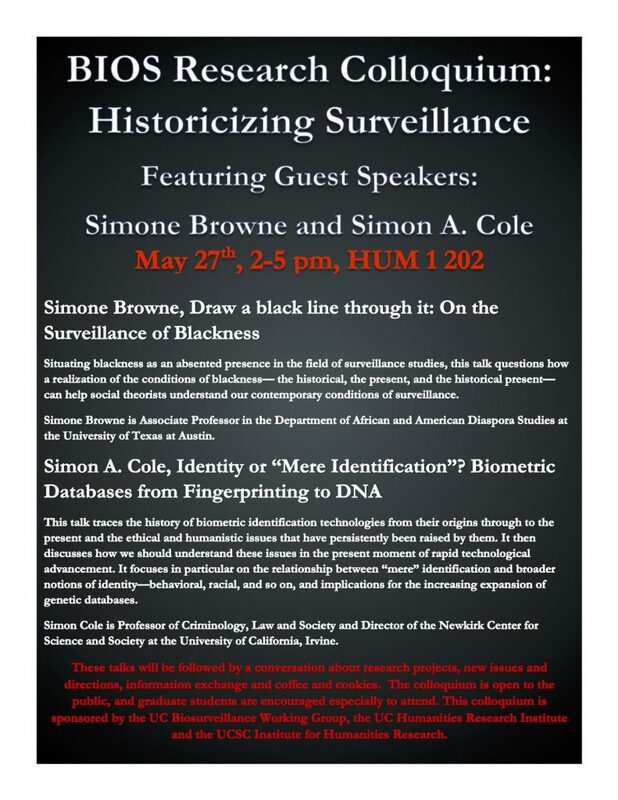 Situating blackness as an absented presence in the field of surveillance studies, this talk questions how a realization of the conditions of blackness— the historical, the present, and the historical present can help social theorists understand our contemporary conditions of surveillance. Simone Browne is Associate Professor in the Department of African and American Diaspora Studies at the University of Texas at Austin. Si mon A. Cole, Identity or “Mere Identification”? Biometric Databases from Fingerprinting to DNA. This talk traces the history of biometric identification technologies from their origins through to the present and the ethical and humanistic issues that have persistently been raised by them. It then discusses how we should understand these issues in the present moment of rapid technological advancement. It focuses in particular on the relationship between “mere” identification and broader notions of identity—behavioral, racial, and so on, and implications for the increasing expansion of genetic databases. 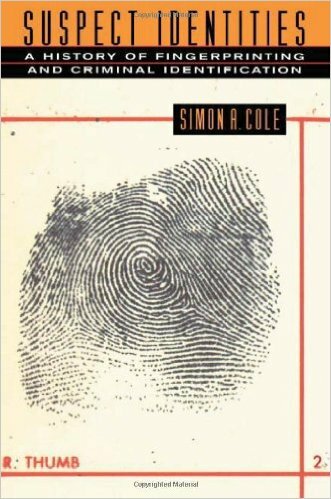 Simon Cole is Professor of Criminology, Law and Society and Director of the Newkirk Center for Science and Society at the University of California, Irvine. These talks will be followed by a conversation about research projects, new issues and directions, information exchange and coffee and cookies. The colloquium is open to the public, and graduate students are encouraged especially to attend. This colloquium is sponsored by the UC Biosurveillance Working Group, the UC Humanities Research Institute and the UCSC Institute for Humanities Research. Click here for a live stream of the event. The past decade or so has witnessed a rapid rise in scholarship that seeks to seize or transform the language of the “science” for liberatory ends. Such an attachment to the reparative and/or divisive logic of “science” is most evident in minoritized knowledge-formations such as sexuality studies and colonial/postcolonial studies. In the face of contemporary challenges about the limits of scholarship bowing out to the forces of globalization, the colloquium will examine what is at stake for sexuality studies and postcolonial studies to carve out a critical relationship to histories of science? What are the conversations instituted about sexuality in relationship to the colonial and postcolonial state in the global south? How does sexuality studies’s own adherence/attachment to science studies parochialize key assumptions about freedom, rights and the subject? What are the ways in which modalities of sentiment, affect, emotion entangle with the logic of state discourses and what role does sexuality play within such exchanges? Omnia El Shakry specializes in the the intellectual history of the Arab world and Europe, with a special emphasis on the history of the human sciences in Egypt. Her current book project, The Arabic Freud: Psychoanalysis and Islam in Modern Egypt, traces the lineaments of psychoanalysis in postwar Egypt. Dr. Duana Fullwiley is an anthropologist of science and medicine interested in how social identities, health outcomes, and molecular genetic findings increasingly intersect. She is the author of The Enculturated Gene: Sickle Cell Health Politics and Biological Difference in West Africa (Princeton, 2011), which examines how structural adjustment policies in Africa affected not only the lived experiences of sickle cell patients in Senegal, but also influenced the genetic science about them. Released to popular acclaim in 1961, Marvel Comics’ The Fantastic Four told of four anticommunist space adventurers who gain extraordinary powers when cosmic rays alter their physiology, respectively granting them control over living flame, invisibility, impenetrable rock-like skin, and physical pliability. In this talk, Ramzi Fawaz explores the surprisingly queer evolution of the series, which used the mutated bodies of its heroes to depict the transformation of the bread-winning father, doting wife and bickering male siblings of the 1950s nuclear family into icons of 1960s radicalism: the left-wing intellectual, the liberal feminist, the political activist, and the potential queer. About the Author: Ramzi Fawaz is assistant professor of English at the University of Wisconsin, Madison. 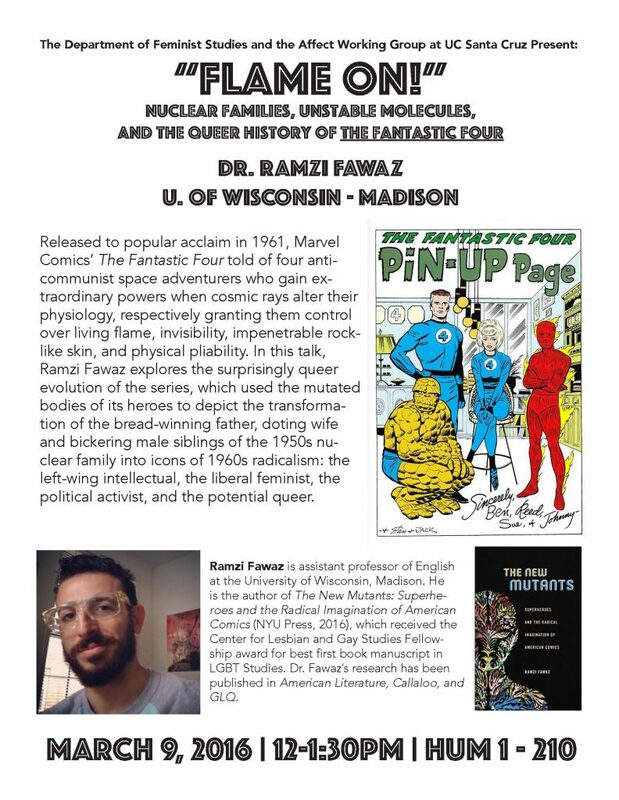 He is the author of The New Mutants: Superheroes and the Radical Imagination of American Comics (NYU Press, 2016), which received the Center for Lesbian and Gay Studies Fellowship award for best first book manuscript in LGBT Studies. Dr. Fawaz’s research has been published in American Literature, Callaloo, and GLQ. 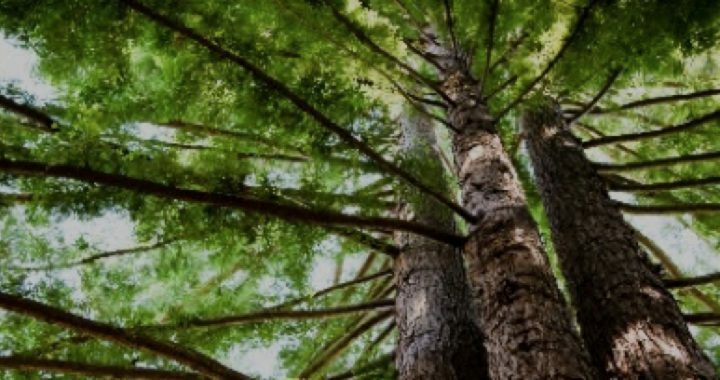 March 8, 2016 – UCSC Emeriti Lecture: James Clifford, "Discovering the UC Santa Cruz Campus"
The University of California, Santa Cruz, built in a redwood forest overlooking Monterey Bay, is famously beautiful. But the usual language of aesthetics does little to reveal what makes the place extraordinary. The lecture, based on years of walking the rugged site, uses color photography and historical research to explore the interaction of architecture and ecology. It traces UC Santa Cruz’s experience of environmental design through changing times and ponders its continued significance. Complimentary parking will be available in the Performing Arts parking lot. Questions? Please contact the Special Events Office at (831) 459-5003 or email specialevents@ucsc.edu. Wendy Hui Kyong Chun is Professor and Chair of Modern Culture and Media at Brown University. She has studied both Systems Design Engineering and English Literature, which she combines and mutates in her current work on digital media. She is author ofControl and Freedom: Power and Paranoia in the Age of Fiber Optics (MIT, 2006), and Programmed Visions: Software and Memory (MIT 2011). She is co-editor (with Tara McPherson and Patrick Jagoda) of a special issue of American Literature entitled New Media and American Literature, co-editor (with Lynne Joyrich) of a special issue of Camera Obscura entitled Race and/as Technology and co-editor (with Anna Fisher and Thomas Keenan) of New Media, Old Media: A History and Theory Reader, 2nd edition (forthcoming Routledge, 2015). She is the Velux Visiting Professor of Management, Politics and Philosophy at the Copenhagen Business School; she has been the Wayne Morse Chair for Law and Politics at the University of Oregon, Visiting Professor at Leuphana University (Luneburg, Germany), Visiting Associate Professor in the History of Science Department at Harvard, of which she is currently an Associate. She has been a Member of the Institute for Advanced Study (Princeton), a fellow at the Radcliffe Institute for Advanced Study at Harvard and a Wriston Fellow at Brown. Her forthcoming monograph is entitled Habitual New Media ( forthcoming MIT 2016). For more information see the Visual and Media Cultures website or email visualmedia@ucsc.edu. A memorial for Marge Frantz (1922-2015) a Hist Con graduate (1984) and longtime colleague at UC Santa Cruz in Women’s Studies and American Studies will be held on Sunday, January 17th from 2-5pm. Refreshments & reception following the program. Ample and free parking is available. Enter UCSC at the WEST entrance. Three stop signs and turn right and proceed to the end of the road. Recital Hall is in front of you. Contributions in Marge’s memory are welcomed by Aptheker/Frantz Women’s Studies Endowment at UCSC, American Civil Liberties Union of Northern California, and Alzheimer’s Association, Northern California and Northern Nevada Chapter. “An inspiring and beloved teacher, skilled activist and generous friend, Marge Frantz died in Santa Cruz on October 16 at the age of 93. Passionately committed to social justice, she identified strongly with the three great social movements of her time: socialism, civil rights and feminism. They shaped her as an organizer, intellectual, and teacher who refused hierarchies while embracing and delighting in differences. She crossed boundaries wherever she encountered them—between teachers and students, academics and activists, young and old, rich and poor, gay and straight, black and white. Her emphasis on commonalities was crucial to the success of the progressive communities she created and sustained throughout her life…” Read more..
Read Frantz’ obituary in the Santa Cruz Sentinel here. 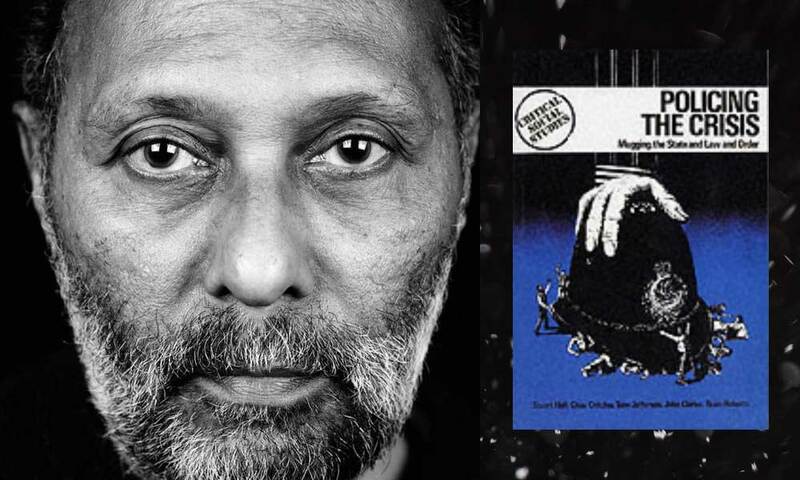 “The theme, Policing Crises Now, is prompted by and departs from the rich and diverse innovations and provocations of ‘Policing the Crisis’ (1978), a groundbreaking work generated by a collective of scholars, including and facilitated by Stuart Hall. Those innovations and provocations include the collective nature of the research, the conjunctural/structural mode of analysis, the attention given to race, gender and sexuality in political-economic dynamics, as well as the analysis of intertwined statistical representations, media representations, legal proceedings and, of course, policing by police, as a response to a “crisis of hegemony. * To advertise your unit or department’s event in the “Of Interest” section of this weekly bulletin, please e-mail complete event information in text format (no PDFs) to cult@ucsc.edu no later than noon on Friday of the prior week. * Additional information and regular updates on “Of Interest” events can be found on the IHR website and on the Cultural Studies website. Andrew March will be speaking about his on-going book project, which is an analytic history of modern Islamic thought on political sovereignty and the foundations of government. Its main focus is on a tradition of thinking on sovereignty that has developed since the late 19th and early 20th century, associated originally with Islamic Modernism and more recently with the thought of Tunisian Islamist Rashid al-Ghannushi and many other thinkers within the broad orbit of the Islamist movement. A central idea advanced in this discourse is that all mankind (following certain verses of the Qur’an) have inherited the vicegerency (caliphate) of God. This doctrine, along with very popular views on the meaning of God’s law which stress the centrality of public welfare and God’s purposes (maqasid) in creating the law, pave the way for a more popular, but still constrained, conception of sovereignty. God remains the ultimate legislator, and the author of man’s rights, but mankind at large (primarily, although not always exclusively, Muslims) is authorized collectively to establish government, constitute itself as a political entity and define in its broad and narrow particulars what it means to apply God’s law. His study is aimed at mapping out these various genealogies of sovereignty, exploring the various paradoxes and ambiguities in trying to reconcile ideals of divine and popular sovereignty in Islamic political theology, and elaborating their most recent doctrinal manifestations and developments since 2011. Andrew F. March is Associate Professor of Political Science, Yale University. His research interests are in the areas of Islamic law and political thought, contemporary political theory, the history of political thought and religion and politics. Maurice Samuels is Betty Jane Anlyan Professor of French at Yale, where he also directs the Yale Program for the Study of Antisemitism. He’s is the author of “The Spectacular Past: Popular History and the Novel in Nineteenth-Century France,” published by Cornell University Press in 2004, and of “Inventing the Israelite: Jewish Fiction in Nineteenth-Century France,” published by Stanford University Press in 2010, which won the Scaglione Prize given by the MLA for the best book in French Studies. He also co-edited “Nineteenth-Century Jewish Literature: A Reader,” published by Stanford in 2013. Erie consists of entrancing single-take, 16mm black-and-white sequences filmed in and around the communities surrounding Lake Erie. Scenes explore African American migration from the South to the North, contemporary conditions, everyday tasks and labors, theater, and famous art objects. Erie has been described as “a revelation… full of images of pure poetry” on Turner Classic Movies’ blog and has been seen and honored at film festival awards around the world. Ohio native Kevin Jerome Everson, who has made six feature films and over ninety shorts, is one of the most prolific and remarkable independent filmmakers working today. His work has been exhibited internationally at festivals, museums, cinemas and galleries, including the 2008 and 2012 Whitney Biennials. A solo exhibition of his short films, More Than That: The films of Kevin Jerome Everson was held at the Whitney in 2011. He has been the subject of career retrospectives at the Centre Pompidou, Paris and Visions du Reel, Nyon. He is the recepient of the 2012 Alpert Award in the Arts for Film/Video. With a sense of place and historical research, Kevin Jerome Everson’s films combine scripted and documentary moments with rich elements of formalism. The subject matter is the gestures or tasks caused by certain conditions in the lives of working class African Americans and other people of African descent. The conditions are usually physical, social-economic circumstances or weather. Instead of standard realism he favors a strategy that abstracts everyday actions and statements into theatrical gestures, in which archival footage is re-edited or re-staged, real people perform fictional scenarios based on their own lives and historical observations intermesh with contemporary narratives. The films suggest the relentlessness of everyday life—along with its beauty—but also present oblique metaphors for art-making. David Brundage is Professor of history and the History Graduate Program Director. The talk will draw on an essay-in-progress for a collection entitled Remembering 1916: The Easter Rising, the Somme and the Politics of Memory, ed. Richard S. Grayson and Fearghal McGarry. Brundage focuses his attention on a period that has been relatively neglected in the history of the Irish in America, the 1920s through the early 1960s. How (and by whom) was the 1916 Rising remembered in this period? Providing some answers to this question can tell us a great deal about the striking diversity of memory practices, while also shedding light on important aspects of Irish American (and American) life in these decades. A once powerful Irish American nationalist movement shrank dramatically in this period. Nonetheless, the Rising continued to be remembered (differently) by Catholic churchmen, Irish American labor leaders, African American nationalists, and Hollywood. The telling of the Easter Rising story, Brundage argues, had a kind of modular character. That is, narratives of 1916, frequently marked by stirring examples of idealism, courage, and sacrifice, could be lifted out of their specifically Irish context and used to legitimize or inspire other sorts of movements and agendas—or simply to entertain. Remembering 1916 in America involved a diverse array of people, practices, and motives, and its analysis has the potential to shed light on important mid-twentieth century topics ranging from African American nationalism to representations of Ireland and the Irish in American popular culture. This talk is a meditation on remaindered life, the unsubsumable, indivisible yet every-diminishing leftover of life-making practice for those who live in proximity to a social state of utter valuelessness. Drawing on diverse yet connected social contexts of redundant or superfluous populations, including undocumented immigrants, refugees, guest workers, and criminalized black and brown men and women, in a global, post-Fordist economy where all life bears the potential to serve as a direct means and source for the extraction of capitalist value, the talk explores the significance of lives lived on the perpetual verge of being nothing not only to offer an alternative account of the current globopolitical order. Tracing the constitutive elements of slavery and colonialism in this global present, the talk also reflects on the petty social currencies of small-time living as a speculative exercise on what is to be done next. Daniel Press is the Olga T. Griswold Professor of Environmental Studies and Executive Director of the Center for Agroecology and Sustainable Food Systems at UC Santa Cruz. His research interests include environmental politics and policy, land preservation, water quality regulation and management, industrial ecology, and policy analysis. He is the author of Democratic Dilemmas in the Age of Ecology: Trees and Toxics in the American West (Duke University Press, 1994), Saving Open Space: The Politics of Local Preservation in California (UC Press, 2002), and American Environmental Policy: The Failures of Compliance, Abatement and Mitigation (Edward Elgar, 2015). Roger Linington is Associate Professor of Biochemistry at UC Santa Cruz. His research centers on marine natural products used in biomedical science. Linington’s research has two major focuses: drug discovery for neglected infectious diseases including malaria, TB and dengue fever, and the use of natural products as probes for biological systems. Anita Chang is an independent filmmaker, educator and writer. She is also currently a PhD Candidate in Film and Digital Media, UC Santa Cruz. Chang’s films are engaged in discourses on (post)colonialism, ethnography, diaspora and cross-cultural representation. Chang has taught film in numerous community and academic settings in San Francisco, Nepal and Taiwan. Honors include grant awards from Creative Capital, Fulbright Foundation, San Francisco Arts Commission, National Geographic and KQED Peter J. Owens Filmmaker program. Her essays have appeared in positions: asia critique, Concentric: Literary and Cultural Studies and Taiwan Journal of Indigenous Studies. Kim Abeles is an activist and artist whose installations and community projects cross disciplines and media to explore biography, geography and environment. The work merges hand-crafted materials with digital representations. Abeles received the 2013 Guggenheim Memorial Fellowship, and is a recipient of fellowships from J. Paul Getty Trust Fund for the Visual Arts, California Community Foundation and Pollock-Krasner Foundation. She is a 2014/15 Lucas Visual Arts Fellow at the Montalvo Arts Center. She has exhibited in 22 countries, frequently creating artworks site specific to the location, including large-scale installations for exhibitions in Vietnam, Thailand, Czech Republic, England, China, and South Korea. Kim TallBear (University of Texas, Austin) will join us to discuss how genomics forms along with notions of race and indigeneity (the topic of her 2013 monograph, Native American DNA) and the novel roles that Native geneticists are playing in intervening in these processes to create a more just and democratic approach to genomics. Through the lens of “resistance,” the current critical ethnography examines some causes of “strike-like” behavior observed in a Spanish heritage language class in a US southwest charter high school. Fundamental to student resistance was the lack of meaningful activity and authentic materials that connected curriculum to students’ linguistic strengths, target-culture knowledge, and the communities from which they came. The native Spanish-speaking teacher taught the course as if the Mexican-origin students were foreign language learners without certain native-like language proficiencies and insider cultural knowledge gained from actual experience. In turn, the instructor did not fully access his own linguistic and cultural repertoire, but instead relied on published foreign language materials that failed to engage students and constructed them as linguistic and cultural outsiders. A pueblo-based pedagogical framework is proposed to make curriculum more culturally relevant, authentic, and engaging. Perverse Modernities transgresses modern divisions of knowledge that have historically separated the consideration of sexuality, and its concern with desire, gender, bodies, and performance, on the one hand, from the consideration of race, colonialism, and political economy, on the other, in order to explore how the mutual implication of race, colonialism, and sexuality has been rendered perverse and unintelligible within the logics of modernity. Books in the series have elaborated such perversities in the challenge to modern assumptions about historical narrative and the nation-state, the epistemology of the human sciences, the continuities of the citizen-subject and civil society, the distinction between health and morbidity, and the rational organization of that society into separate spheres. Perverse modernities, in this sense, have included queer of color and queer anticolonial subcultures, racialized sexualized laborers migrating from the global south to the metropolis, nonwestern desires and bodies and their incommensurability with the gendered, national or communal meanings attributed to them, and analyses of the refusals of normative domestic “healthy” life narratives by subjects who inhabit and perform sexual risk, different embodiments, and alternative conceptions of life and death. The project also highlights intellectual “perversities” from disciplinary infidelities and epistemological promiscuity, to theoretical irreverence and heterotopic imaginings. The Friday Forum is a graduate-run colloquium dedicated to the presentation and discussion of graduate student research. The series will be held weekly from 12:00 to 1:30PM and will serve as a venue for graduate students in the Humanities, Social Sciences, and Arts divisions to share and develop their research. Light refreshments will be available. This presentation is not about drones per se – or even war per se; but rather about the deployment of ubiquitous, always-on, networked sensors for the purposes of automated data collection, processing, and response. It is also about the ways in which the logic of drone warfare: prediction and pre-emption, come to characterize a wide realm of social practices: marketing, job screening, health care, romance, and more. The presentation considers the ways in which some contemporary strands of critical theory replicate and rehearse the logics of data-driven droning: the advent of drone theory. Mark Andrejevic is an Associate Professor of Media Studies at Pomona College. He researches the relationship between popular culture, interactive media, and surveillance. His books include, Reality TV: The Work of Being Watched (2004), iSpy: Surveillance and Power in the Interactive Era (2007), and Infoglut: How Too Much Information is Changing The Way We Think and Know (2013). 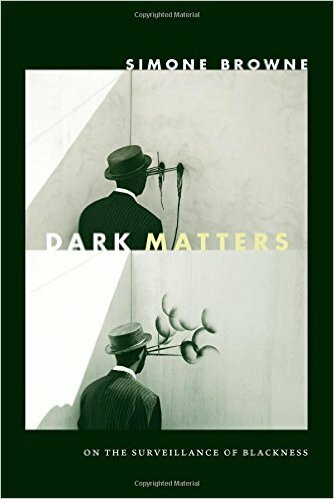 He examines the social and cultural implications of data mining, predictive analytics, and other forms of surveillance that have become integral to how subjects interact with digital media and popular culture. This talk examines processes of religious transmission among members of minority diasporic religious communities, with a focus on British Sikhs. 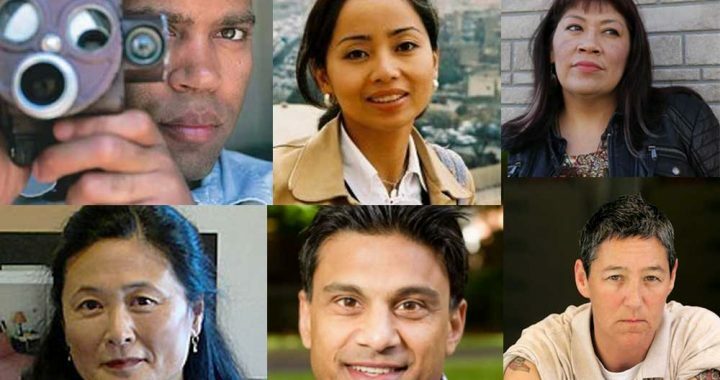 Using ethnographic methods including the first ever large scale online survey of British Sikhs, this paper explores the shift which has occurred for many young South Asians in Diaspora who now identify more closely with a religious as opposed to an ethnic identity. Focusing on a number of different arenas of religious transmission including families, religious institutions and the internet, this paper examines how processes of religious socialisation and familial nurture impact on identity, in particular among young people entering the phase of ‘Emerging Adulthood’ (Arnett 2004). Dr Jasjit Singh is a research fellow at the University of Leeds based in the School of Philosophy, Religion and the History of Science. His research examines the religious lives of South Asians with a particular focus on understanding processes of religious and cultural transmission among Sikhs in diaspora and the different arenas in which this transmission occurs. To date he has examined the relationship between traditional arenas of religious learning (including the family environment and religious institutions) and newer arenas of transmission including camps, University faith societies and the Internet. He has recently undertaken a project examining the cultural value of South Asian arts and has a growing interest in the role of religious media. Hanna will present her recent work, We are History: A People’s History of Lebanon, a digital interface that collects varied oral histories of a people and presents them in a disruptive but dialogical manner. Using contemporary oral histories about the 1981 siege of Zahle, Lebanon, the software is given the goal of generating a narrative from the transcripts of said oral histories. Fabiola Hanna is a new media artist, software designer and activist currently using her skills to address historical amnesia in Lebanon. She is a PhD candidate at the University of California, Santa Cruz, where she also gained her MFA in Digital Arts and New Media. Her research lies in software studies, new media art activism, and archives and memory. Her work has been exhibited at the Museum of Art and History in Santa Cruz, the New Children’s Museum in San Diego, the SubZero Festival in San Jose, the Digital Arts Research Center in Santa Cruz and the MakerFaire in San Mateo. The screening will be followed by Q & A with Director Yang Yishu and her daughter who played the daughter in the film. “One Summer” is Director Yang Yishu’s first fiction feature. In tracing a woman’s efforts to find her husband and to understand why the police took him away without explanation, the film portrays the sentiment of perpetual anxiety, uncertainty and vulnerability that prevails contemporary China. The film was selected for the 19th Busan International Film Festival (Korea, October 2014 ) and the 21th Vesoul International Film Festival (France, February 2015), and was awarded the Jury’s Prize. “One Summer” follows Director Yang’s two documentaries, “Who is Haoran?” (2006), and “On the Road” (2010). “Who is Haoran?” was selected for the 59th Locarno International Film Festival, and the 31th Hong Kong International Film Festival. It has been collected by Songzhuang Art Center (a major base of Chinese independent cinema) and released by Lixianting Film fund. “On the Road” was selected for the 7th China Documentary Film festival, the 7th China Independent Film Festival, and 2011 Seoul Independent Documentary Film & Video Festival. Director Yang Yishu represents an important voice in contemporary independent Chinese cinema. In addition to making films, she also teaches as Associate Professor and serves as Associate Director of Film and Video Production Center in the Department of Drama, Film & TV, in the School of Liberal Arts at Nanjing University, China. Alexander Dent’s work uses notions of performativity to analyze mediation, language, policy, piracy, Intellectual Property (IP), and music. This essay uses confidence as a metric for contemporary capitalism, which relies upon aggressively propertizing, individuating, and consumption-oriented epistemologies. His argument is that market based logics often involve: a) unitary and materialistic theories of economic actors, goods, and services on the one hand; and b) the notion that these actors, goods, and services are not only highly symbolic, but also deeply multivalent on the other. His first book, River of Tears: Country Music, Memory, and Modernity (Duke, 2009) explored the dialogic relationship between traditional and commercial forms of Brazilian `country` as a way of getting at late capitalist rurality. More current work investigates the ways in which IP policing seeks to control the unruly materializations at work in digital reproduction, as well as the ways in which the United States Trade Representative’s practices delimit the “publics” in “public interest.” Dent received his PhD from the University of Chicago (2003). He lives in Washington DC, where he is a practicing musician. This year’s works include: (in French) THE GAP, by Ionesco, and a scene from THE WOULD-BE GENTLEMAN by Molière, directed by Miriam Ellis; (in Italian) BROTHER ATM and SERENDIPITY, by Benni, directed by Giulia Centineo; (in Japanese) SWEET POISON, traditional, directed by Sakae Fujita; (in Russian) THE PATIENT, by Dovlatov, directed by Natalya Samokhina; (in Spanish) MISERY, by Güiraldes, directed by Marta Navarro. The pieces range in time from medieval and classical periods to modern-day theater, with emphasis on their comic elements. Over the years, the IP presentations have represented an important annual event for UCSC and have attracted a loyal following. In addition to those on campus, many community members, as well as faculty and students from high schools and Cabrillo College, attend regularly. The English titles make the material easily accessible to audiences, who are afforded a rare multicultural experience by the diversity of the programs. 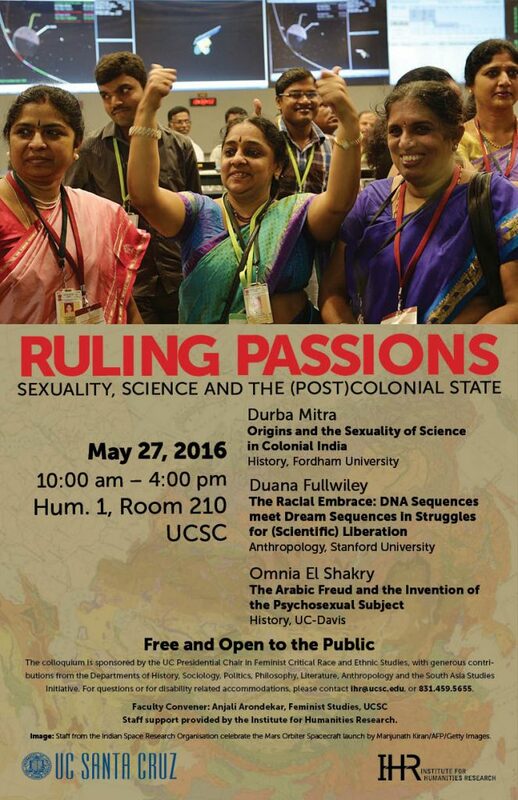 For further information, please contact lmhunter@ucsc.edu or ellisan@ucsc.edu. This 3-day symposium will reflect a variety of approaches to documentary from a range of fields including film, video, new media, art practice, media and visual culture studies, visual anthropology, and ethnography. Keynote speaker: Kevin Jerome Everson (University of Virginia) who represents disparate yet interconnected approaches to documentary practice as research. Innovative panels will bring scholar-practitioners into conversation about making as thinking. Specific program, times, and locations to be announced.